Your horse is guaranteed to receive tons of compliments on their mane and tail after just a couple uses of Leovet 5-Star Detangler...so don't be surprised if he/she starts to act a little full of themselves! 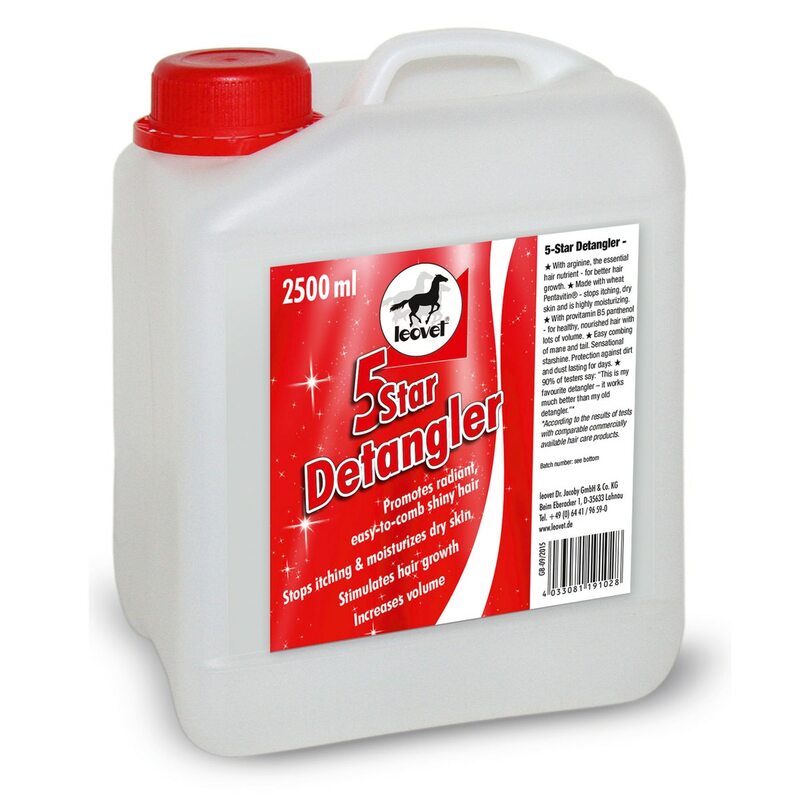 Leovet 5-Star Detangler is a comprehensive grooming product that does more than just detangle! With arginine which is an essential hair nutrient this product both promotes better growth and prevents breakage. Wheat Pentavitin® helps to stop itching, and is extremely moisturizing for dry and flakey skin. Lastly pro-vitamin B5 panthenol promotes the healthy nourished hair with lots of volume that you know your horse is dying for! Available in a 750 ml Spray Bottle and an 84 oz. Refill Bottle. Leovet® 5-Star Detangler is rated 4.8 out of 5 by 22. Rated 5 out of 5 by Jenip01 from I love this So I think we can all agree that this is a great product for horse manes and tails, but it’s also great for dogs. I have a small dog with this soft, fine hair on her ears that gets tangled and matted every time she scratches it, and she itches a lot. At one point, I had to cut all her ear hair off because it was all matted. I’ve tried all sorts of products designed specifically for horses and dogs, and they usually leave her hair feeling greasy or not fixing the problem. So one day when I was at the barn using the 5-Star detangler on my horse, I used like 1/2 a spray on each ear, and not only was I able to brush the small mats out, but it prevented new mats from forming. It also keeps shavings and hay from getting stuck in her hair without leaving her feeling greasy. So long story short, this product helps keep tangles out of my horses’ tails, but dogs hair too! This is the kind of product I love and will buy over and over again because it’s versatile and provides results. Rated 5 out of 5 by katNM from Excellent detangled I bought this based on other reviews. It works great. I used it on my new horse who has a very long, very thick tail, and I'm not sure she's ever had it thoroughly brushed out...at least not for the past year. This product worked beautifully. Her tail was absolutely gorgeous when I got done...at least until she rolled in the dirt the next time. LOL. All my horsey friends may be getting this for Christmas this year. Rated 5 out of 5 by Lori from Excellent product! Love this product! I bought this as it had great reviews. I always used Canter but I prefer the spray on this product better and it conditions and detangles even better. Rated 4 out of 5 by Ginna from Just as described This works really well. I use it before blanketing and as a coat/mane/tail conditioner. It has a nice, not over powering scent and leaves my horses soft and shiny. Really makes manes and tails manageable. I am going through it pretty quickly. 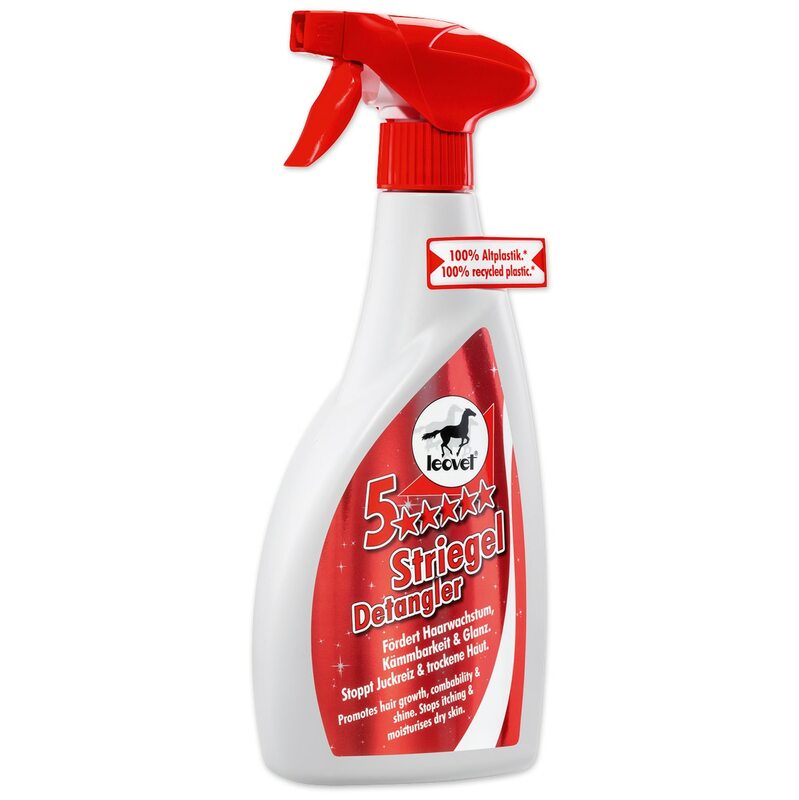 Rated 1 out of 5 by elgallo from Leovet 5 star Detangler The bottle came broken in a plastic bag and it came almost empty and I don't know if it came broken on its way here or they put the bottle broken on propose. I send a email explaining what happen and they never responded to me. For me it wasn't a good server. Rated 5 out of 5 by Tams from Love it Bought this to use on my Friesian mare and it defintely delivers The comb glides through her mane and tail. The effects lasts for days, also. Rated 5 out of 5 by Breezy from Smells awesome and actually works! This stuff is the best detangler I have ever used and the best part is it actually detangles hair. It also lasts for a couples days after using and I can still feel it in his tail three days after first spraying the hair. It also smells really good, like a high end human cologne. Not fruity or too strong. Also not sticky and doesn't leave a residue on hands. Worth the $20 as it's lasted me a few months only using it once a week which is all you need. Also seems to have helped grow out my horse's crazy rat nest looking tail at the top. The ends were frayed in every direction and dry, but they have grown out and look much better. If you want a great detangler that will take and help hair growth, this is the one to get for sure. Rated 5 out of 5 by Arabique from Great detangler Leovet products are becoming my favorite go to. The products work as described. I used this detangler and it has kept my horse's mane and tail silky smooth and dirt free (he loves to roll). No stickiness after it dries or even after multiple applications.